No homeowner wants to experience a leaky toilet; unfortunately, toilet leaks are one of the most common plumbing problems. It’s no surprise that toilets can spring a leak when you think about how often they’re used. More than likely, the toilet is the most frequently utilized plumbing fixture in your home. Still, that doesn’t make it any easier to deal with a leaking toilet. And unfortunately, toilet leaks aren’t always obvious. Slow leaks can go undetected for a while; meanwhile, they may be causing a great deal of water damage. By knowing how to spot common signs of toilet leaks and how to fix a leaking toilet, you can prevent costly water damage in your home. Of course, the most obvious sign of a leaky toilet is water where it doesn’t belong. Depending on the severity of the leak, most homeowners will notice a small pool or puddle of water around the base of the toilet itself. However, even if you don’t spot any obvious signs of a leak (such as standing water), you could still have a slow leak that needs to be addressed. For this reason, it’s always a good idea to inspect the area around the base of your toilet every month or so to check for signs of moisture or water damage. For example, a soft or spongy feel on the floor around your toilet could indicate a leak that has penetrated the floor and begun to rot out the subfloor underneath. Regardless of how minor your toilet leak may be, it is important to address it as soon as possible. In the meantime, if you have access to another toilet in your home, it may be best to stop using the leaky toilet until a repair has been made. There are many potential causes of toilet leaks, especially around the base of the toilet. The good news is that most of these causes are relatively easy to fix. One of the most common causes of a leaky toilet is loose toilet tank bolts. Over time, these can loosen up and allow water to leak through; if this is the case with your toilet, you will likely notice water leaking from around the bolts when you flush. This is a very simple repair that only involves taking a set of pliers and tightening the bolts. In some cases, the bolts may need to be replaced. Just be careful not to over-tighten, as this could actually crack the tank or bowl. Another common cause of a leaky toilet is a worn seal. Toilets are generally installed with a wax ring that creates a seal between the bottom of the toilet and the bathroom floor. Over time, these rings may deteriorate and cause leaks. Fortunately, replacing a wax seal on your toilet is a relatively simple and inexpensive project that can usually be completed in a few hours. You’ll want to begin by purchasing a new wax ring from your local hardware or home improvement store. You’ll also need some silicone caulk (ideally in a color that matches your toilet) and some closet bolts (usually 5/16″ in diameter, but check your existing toilet to be sure). Always begin any toilet repair by shutting off the water supply to your bathroom. Then, continue by loosening the bolts that hold your toilet to the bathroom floor. Once the toilet is removed, you should see the existing wax ring. More than likely, it will be very deteriorated. You’ll want to remove it. Depending on how much it has deteriorated, you may need to scrape it away from the floor in pieces using a putty knife or similar tool. Once the existing ring is removed, take time to clean up the area around the ring so that you have as level and even a surface as possible. Then, you can secure the new ring with screws before bolting the toilet back down. Just be sure that when you replace the toilet over the ring, the toilet itself doesn’t rock even slightly when you sit on it. If it does, this will cause the new ring to deteriorate quickly and a new leak to occur. If you have a toilet that rocks, you may need to stabilize it with shims to prevent the problem from occurring over and over. 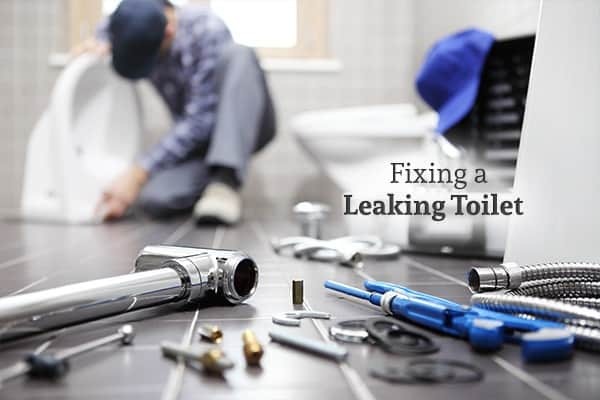 Addressing many sources of toilet leaks can be a relatively simple job, but if you’re experiencing a major leak or if you’re not comfortable performing these repairs yourself, it’s in your best interest to call a professional plumber. 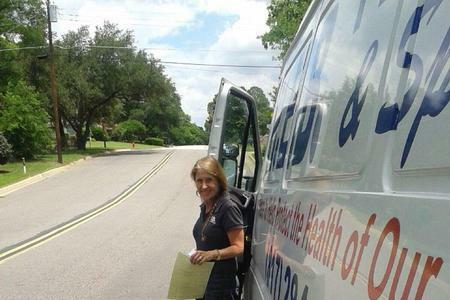 At HEB Plumbing & Sprinkler, you can get the quality service you deserve. Contact them today to schedule your appointment.